Welcome to Diagnostic World, the best place to buy a car scanner online. Auto diagnostic kits & tools for the home DIY mechanic, or professional mechanic alike. We offer chip tuning kits, OBD2 code readers, airbag reset tools, service reset tools, ABS code readers, mileage correction & MOT dash light diagnostic tools. Many of these scanners will reset a trouble code or remove a light from your dashboard such as airbag, check engine, service engine soon & ABS. They will also give you the OBD2 problem code. Universal online car scanners only work for petrol cars 2001 & later, or diesel cars 2004 or later. If your vehicle was manufacturerd before these dates we may still have the tools for you, so please contact us by emailing enquiries@diagnostic-world.com. For 2019 we are proud to annouce that we are to sponsor the Driver 81 YouTube Channel. So please take a look at the channel. Diagnostic World are please to partner up with the YouTube channel Driver 81 for 2019. Please subscribe to this channel for giveaways & great automotive content. Diagnostic-World.com is not just an online shop to buy auto diagnose kits. We are also here to help you with your diagnostic problem and have free guides for your to study and look through. 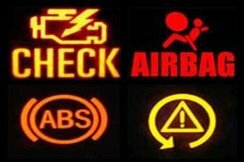 In the UK the MOT test has been changed and your car will now fail it's MOT if certian dashbard warning lights are on show. For example the engine warning light, ABS warning light & SRS airbag warning light. These lights must be turned off in order for the vehicle to pass the MOT. We stock the tools for doing this job, click here for the MOT dash reset tools. We also have a dashboard light/symbol guide for all cars, including videos and visuals from your vehicle handbook. Its basically a quick guide to all the dashlights your likely to see on your dashboard. Well worth bookmarking. Please be patient with us as we upload these guides, as you can imagine it is quite a long process but if you need any info in the meantime please just get in touch. We also have a trouble code directory on our partner site Dominator Auto Diagnostics. Also known as dtc trouble codes, check engine codes & fault codes. Click the dashboard lights to the right of this text to view dashboard lights & trouble codes for your vehicle. You will find hits & tips on how to remove the dashboard light, and answers questions like how to reset the engine light, how to reset service light, how to reset or turn off the airbag light. Once you have found the specific light which is on your dashboard and the solution is not obvious then we will tell you exactly which diagnosic tool you will need to get the job done. Parts are sent out same day so wont have to wait too long before your car is back on the road with a clean bill of health.